Credit: Dan Orlowitz, Football Channel Asia. Given that 88 mph is 141 KMH, it’s really no surprise that Doc Brown and the legendary time-traveling DeLorean were “pulled over” by Japanese traffic police in a Skyline GT-R in a traffic safety demonstration put on by the Yokohama Toyota dealer network. These amazing pictures of Back to the Future’s iconic DMC supercar driving around the Todoroki Stadium in Kawasaki Japan come to us from photographer and soccer reporter, Dan Orlowitz. 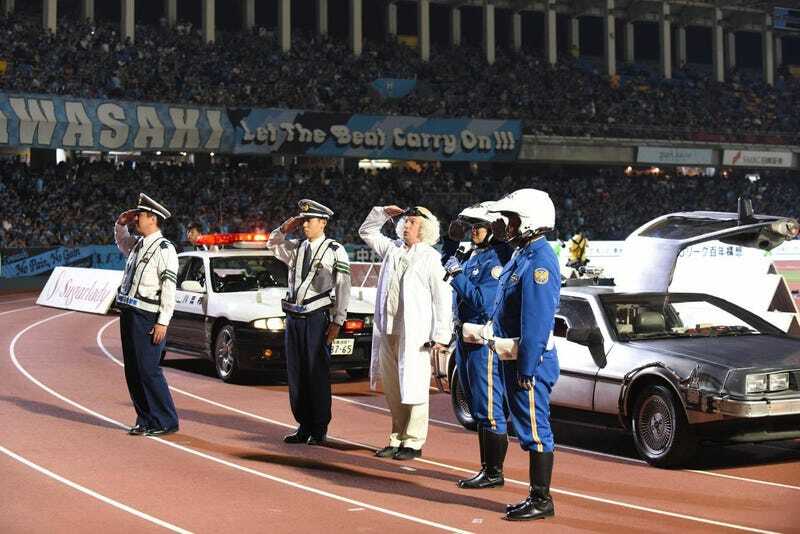 Orlowitz recently reported on Football Channel Asia that the replica time machine’s “trouble with the law” was the most recent in a long series of “safe driving” performances which have taken place at the stadium in conjunction with the local soccer team, the Kawasaki Frontale. According to Orlowitz, previous performances included F1 vehicles, and a classic Bugatti played second fiddle to the DeLorean this time around.